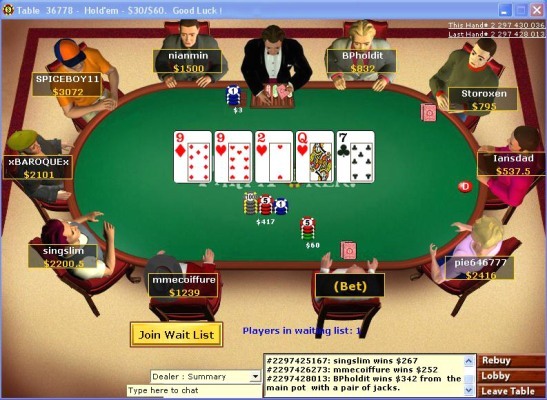 Party Poker is one of the largest poker rooms that is not available to U.S. Players. Party Poker used to be the #1 poker room in the world when it was open to U.S. Players, but since U.S. Players have been banned from that site, Party Poker took a significant hit. Still, it offers some of the best cash games and tournaments in the world. Party Poker usually has many different promotions running since it is such a large poker room. However, many players complain of the complexity of their promotions. The promotions are always changing to keep players interested. One example of a promotion was on August 10th when Party Poker celebrated their 7th birthday by offering a $1 million guaranteed tournament called the Birthday Bonanza. Party Poker offers a 100% up to $500 matching bonus to all new players. A promotional code should be included to ensure the player receives the bonus. Bonus money is given in 5 different parts and a player must earn 5 points for every 1 bonus dollar. The minimum deposit a player can make onto Party Poker is $25. By playing on Party Poker, players are able to receive up to 40% rakeback from third parties which is deposited into their account monthly. This is huge compared to other sites. Party Poker is a great site to play on if a player prefers tournaments. There are tournaments of all different buy-ins from very cheap to expensive. Once a month, the site hosts its biggest tournament, the Party Poker Million, which bodes an over $600 buy in. Party Poker never has an issue with traffic. It is a very large poker site and usually has about 10,000 real money players during the peak hours. Party Poker software is not known to be the best. It is still clearly lagging in terms of graphics. However, it is still very simple to navigate and it is known for running very quickly, besides for the occasional lag-time when loading the lobby screen or game table. Players would think with the site being so big the support would be good, but that is not the case with Party Poker. Party Poker does offer phone and email support, but the emails take very long to receive and they often don’t answer the players question properly. As well, agents on the phone are not always as friendly as one would expect. This entry was posted on Wednesday, September 16th, 2009 at 2:07 pm and is filed under Poker News. You can follow any responses to this entry through the RSS 2.0 feed. You can leave a response, or trackback from your own site.